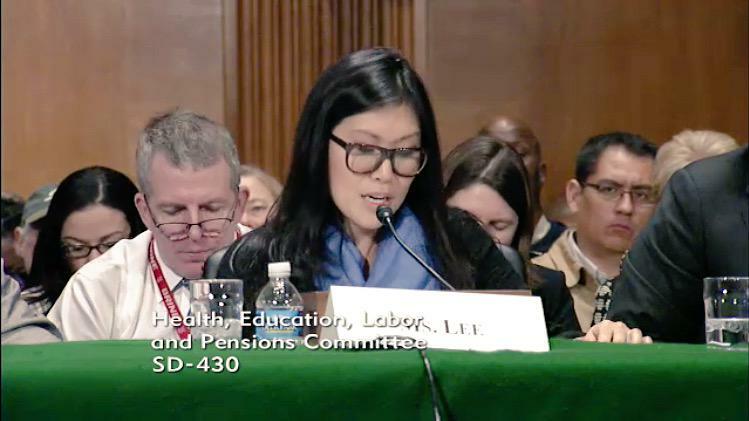 Jia Lee, who is a special education teacher at the Earth School in Manhattan, testified at a senate hearing on No Child Left Behind (NCLB) on January 21st. As an act of conscience, Jia joined two other teachers last year in refusing to administer high-stakes standardized tests, citing their negative impacts on students. She is a parent who has opted her own child out of testing, joining thousands of parents around the nation. View Jia’s testimony here. Thank you Chairman Alexander and Senator Murray for this opportunity to offer my remarks regarding the impact of No Child Left Behind’s testing and accountability provisions on our public school children. I thank you for your vision and for this opportunity. I have an eleven year-old son in sixth grade, so I speak to you as both a public school parent and a teacher. Business practices are informing education policy, so I would like to start there. The use of competitive, performance based practices have long been assumed to motivate workers. Microsoft, Expedia and Adobe Systems are just some of the companies who adopted stack ranking, the now infamous practice of applying rewards, consequences and rankings based on performance. These same business advisors informed many of our nation’s biggest school districts, including mine. In the past few years, businesses have abandoned this practice because they have proven to have disastrous affects on collaboration, problem solving, and innovation. The high exodus of workers seen in these businesses are attributed to stack ranking (Oremus, 2013). Studies, including those sponsored by the Federal Reserve Bank , find that incentive-based practices only work for the most menial tasks that do not require critical thinking (Ariely, et. al., 2005). What was bad for business has been disastrous for public education, a field already plagued with recruitment and retention challenges. Educators with valuable experience are leaving the profession in droves and enrollment in teacher preparation programs is abysmal. students stated that all they accomplished throughout the year meant nothing. When parents and educators voice concerns, they have been accused of coddling. I want to challenge that assumption. The great crime is that the focus on testing has taken valuable resources and time away from programming in social studies, the arts and physical education. At my school, we no longer have a librarian and our parent association works full time to fund needed arts programs that are not provided for in our budget. We are one of the lucky schools. What about schools where parents must work just to survive? I know schools that no longer have money for basics such as soap for the bathrooms. There is nothing more painful to watch or forced to be complicit to than the minimalizing that is happening in our schools. Teachers, students and parents find themselves in a position of whether or not to push back or leave. Who is left to receive these tests and accompanying sanctions? Who are the children receiving scripted curricula while losing recess, physical education, music and civics lessons? It is our students from the most marginalized communities. A current study by the Southern Education Foundation finds that more than 50% of our public school children are living in poverty, an all time high in fifty years (Layton, 2015). Black and Latino students live disproportionately at or below the poverty line, and it is no accident that we are faced with the most segregated school system in history, with disproportionate number of school closures happening in the poorest communities- all at the hands of using invalid metrics. It is what pushes me past my comfort zone and to speak out. I have worked in different schools, some of which, through no fault of their own, have become increasingly data driven as opposed to student driven. I am fortunate to currently work in a public school that was founded on the principles of whole child education, where we, the teachers, collaborate to develop curriculum and create relevant assessments. It is the antithesis of stack ranking. This year, our 4th and 5th graders are immersed in a study we call Rights and Responsibilities. Students develop questions around the origins of the United States, the Constitution, and discuss the complex struggles and progress we have made as a nation. My class decided to divide themselves into groups to study three different perspectives from the colonial era – the Native people, European colonists and the African slaves. They are the researchers, using primary and secondary sources to learn about key events, figures, and cultural and political ideas. My integrated co-teaching class consists of students with disabilities, or I should say, all abilities, and they work in heterogeneous groups to present their understandings through a variety of mediums: creating art pieces, choreographing original dance pieces, presenting timelines, developing maps, conducting process dramas, and giving oral reports. They are learning “how” to learn, developing lifelong skills: researching, analyzing information from multiple sources, collaborating with others and sharing what they’ve learned in creative and thought-provoking ways. They are the stewards of their own learning, guided by their interests and passions. I share this not as a best practice but to emphasize the importance of fostering learning environments that value a culture of trust, diversity, and teacher autonomy not a focus on test preparation. Teachers’ working conditions are inextricably linked to students’ learning conditions. Last year, over 50% of the parents at our school refused to allow their children to take the NYS Common Core aligned ELA and Math tests and we were not alone. The Latin root of assessment is to “sit alongside.” Until we have teachers and policymakers “sitting alongside” and getting to know our students and our classrooms in deep and meaningful ways, we cannot fully understand the state of public education. No corporate made multiple choice test will give you that data. Last year, I decided that I am obligated and accountable to my students and families, and that is why, as a conscientious objector, I will not administer tests that reduce my students to a single metric and will continue to take this position until the role of standardized assessments are put in their proper place. Along with two other teachers at my school, we formed Teachers of Conscience, a position paper and call to action at local levels. ← Change the Stakes first 2015 meeting in Brooklyn, January 9th!